What is Wooden Pet Gate and Crate? The Wooden Pet Gate and Crate is a versatile and attractive pet accessory to add to your home. 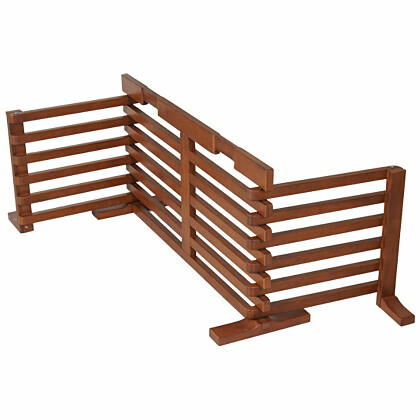 This wooden pet gate can be used for doorways or open spaces ranging 40" to 72" wide, and can also be used as a pet crate when used against a wall. For a secure pet crate to address behavioral issues such as separation anxiety, we recommend the Super Dog Crate. The Wooden Pet Gate and Crate folds and expands to fit doorways ranging from 40" to 72" inches. This pet gate can also be used against a wall to enclose your pet inside, similar to a crate. This item is not designed or intended to be used as a child safety gate. Please take the proper precautions when used around young children. The Wooden Pet Gate and Crate is already pre-assembled. The feet require assembly with the use of a Philips screw driver. If ball-bearings do not catch; panels swing open easily - Remove the long feet (Part 2) and tighten the nut at the end of the pin hinge that runs through all of the panel slats. Assemble on rug or cardboard to prevent scratches to the floor and product.